If imitation is indeed the sincerest form of flattery, we should be blushing over the success of the Craterian Performances season brochure. 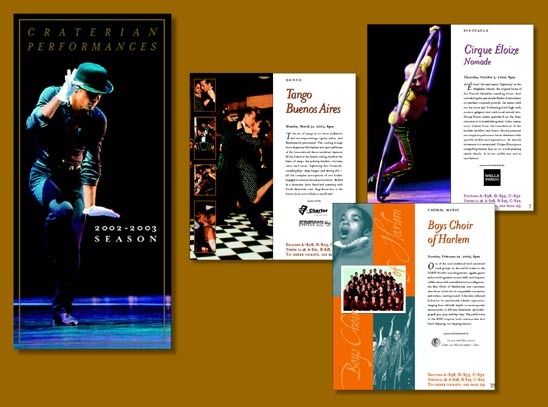 Just a few seasons after its creation and introduction, the dramatic and functional booklet format inspired changes in performing arts publications throughout the area, including a switch to the vertical saddle-stitched format by the Oregon Shakespeare festival. Actually, we predicted that the new format would be replicated locally; it just works so much better than the awkward unfolding brochures other venues were then using. It is easily mailable, incredibly convenient to flip through and order from, and yet still fits in a standard brochure rack. Redesigned every year, the Craterian Performances season brochure effectively reminds theater goers in Southern Oregon what the Craterian Ginger Rogers Theater really is: an unparalleled indoor venue offering Rogue Valley residents and visitors world class not-to-be-missed arts and entertainment. Businesses and individuals in search of real value in Oregon advertising should contact CarterWorks about ads in the Craterian’s other yearly publication, the Craterian playbill. It is handed out free of charge to the thousands of locals and visitors who attend everything from circuses to operas at the theater.